At our Wymondham site we have an extensive range of steel fabrication equipment allowing us to offer a full range of services to our clients from initial concept to installation. Standley Steel offers expert advice on all of the services we provide, whether through ourselves or our third party suppliers. Through many years experience we have built up a network of reliable and trusted suppliers to offer the extra value our customers have come to expect. We are able to visit your site at the concept stage, to advise of the best way to approach your project. 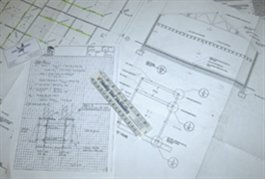 Through our partnership programme, we are able to offer Design and Engineering Calculations for all your requirements. See F.A.Q section (Planning your own project and would like to know more) for more information.